The Southern Poverty Law Center will host a 30-minute audio chat on hate groups and other extremist organizations at 1 p.m. Eastern Standard Time on Wednesday, March 2. Questions can be submitted before and during the webcast for those who register. The tally of white-supremacist hate groups reached a record high in 2010, a spike stoked by the supremacists' anti-immigrant fervor, rage against a White House occupied by a black president and the continuing uptick in the nation's count of nonwhite residents, researchers said last week. "There's no question that Obama's election drew people into the hate world. These groups' [online] servers were crashing on the night of the election from all the traffic," said Heidi Beirich, director of research for the Southern Poverty Law Center (SPLC). Its spring 2011 Intelligence Report, released Thursday, lists 1,002 hate groups, a 7.5 percent increase since 2009 and a surge of 66 percent since 2000. The Intelligence Report — it launched in the early 1980s as Klanwatch but now details information on hate groups of every racial stripe — goes to 55,000 law-enforcement agencies and individuals who police and/or study the organizations. While these organizations' verbal venom is protected by the First Amendment right to free speech, the violence that venom frequently advocates is legally forbidden. "There are many who live a life inside of a hate group, spewing hatred and marching around in their pointy-head suits, but leaving it at that," said Jim Cavanaugh, who retired in 2010 as a federal Bureau of Alcohol, Tobacco and Firearms special agent, in an interview with The Root. He investigated noted cases such as the mid-1990s black-church burnings in the South. Cavanaugh continued: "There's also a fraction that feels they need to take offensive action. Law enforcement's challenge is sorting out the three or four out of a hundred supremacists who are going to go out and do violence offensively … bombing a synagogue, burning down a black church, burning an Obama sign that an interracial couple put in their front yard." People such as James W. von Brunn, an 88-year-old white supremacist and anti-Semite who was indicted on a charge of walking into the United States Holocaust Memorial Museum in June 2009 and shooting Stephen Johns, a black security guard, before being shot himself. Von Brunn died in a hospital while waiting for the case to go to trial. Race-fixated hate groups are one of three categories of organizations detailed in the Intelligence Report. Also monitored are anti-government "patriot" groups and anti-immigrant, "nativist extremist" groups. After a temporary decline, patriot groups are on the rise, numbering 824 in 2010. That's a 61 percent increase from 512 such groups in 2009, but lower than the 858 documented in 1996. Patriot militias (armed paramilitary groups) rose to 330 last year from 127 in 2009, a leap of 160 percent. So-called nativist extremist groups, which directly confront immigrants and their employers, rose during the same period by 3 percent, to 319 from 309. 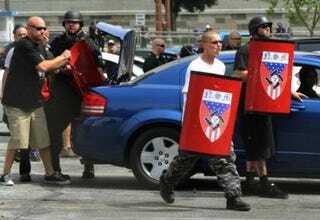 Hate, nativist extremist and patriot organizations total a current 2,145, a 22 percent rise above the figures in 2009. "The tough part is that there is no clear-cut answer to who joins these groups and why," Angela King, 35, told The Root. She was active in white-supremacist groups for eight years, starting when she was 15. "There are people from so many different backgrounds, different socioeconomic backgrounds, anything you can imagine. They're not just poor white kids, kids from broken homes. You've got people from perfect families, who never suffered any kind of abuse … professionals, police officers, lawyers, not just somebody you'd find flipping burgers at a fast-food place." King decided to abandon her belief in white supremacy after befriending several Jamaican immigrants, convicted drug mules, while in prison in her native south Florida. Having been locked up for three years for an armed-robbery conviction, she has now relocated to a state that she does not want to publicly disclose. (Pledging a lifelong commitment and then leaving hate groups makes you a target, she says.) King has since earned two college degrees. She is a restaurant manager and social-justice activist, lecturing and organizing against race hatred. That the scourge of hate continues to spread does not surprise researchers at the Montgomery, Ala.-based SPLC. "What we're hoping to do is bring a public awareness so that people understand there is a significant and violent radical-right wing," said Mark Potok, editor of the Intelligence Report. "In no way do we want to suppress free speech or extremely robust political debate … but we're seeing an enormous amount of anti-immigrant propaganda and a demonizing of particular groups of people that sets up members of these hate groups to commit acts of violence." Brooklyn, N.Y.-based freelancer Katti Gray writes for several national and regional news organizations.